Maximum Service. Maximum Selection. Maximum Satisfaction. New Trailers • Boat - 4000 Lb. - 8000 Lb. Boat - 4000 Lb. - 8000 Lb. ShoreLand’r is committed to offering not only the best performing trailers, but also the safest. That’s why we put brakes on all models with capacities over 3,100 lb. 700 lb. to 1,500 lb. Capacity Boat Trailers: This traditional bunk configuration has both vertical and horizontal adjustments. It features fully carpeted bunks and keel protective pads to protect your craft while in transit. 1,800 lb. to 15,000 lb. Capacity Boat Trailers: Patented Equiload Support separates this trailer’s support characteristics from any other on the market. This system evenly distributes the weight of your boat for smooth launching and loading. The teeter-totter style bracket pivots on the rear cross-member to insure that every square inch of bunk or roller is doing its share to support your boat’s hull. 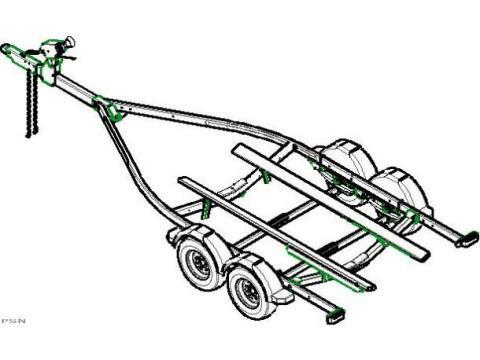 NOTE: Recommended carrying capacity is based on shipping weight of the trailer with standard equipment. Adding optional equipment may decrease the trailer's carrying capacity. See your dealer for your specific application. Multiple eight-inch rollers on a dual-pivoting bracket provide equalized and constant support directly to the keel of the boat, its strongest point. Smaller units use a polyethylene pad or a single roller depending on capacity of the trailer. The pads on the cross-member protect the hull and help center the boat during loading. Keep grease in and water out to prolong the life of the running gear. The coupler / actuator is bolted on for easy replacement if necessary. The industry standard has been set by the patented, ShoreLand’r Custom Molded Fender. Every fender is molded from a composite material that will not rust and springs back after minor impact. The larger series’ fenders have integrated step pads and are enclosed on the inside to protect the side of the boat. Drop axle gives trailer a lower profile for smoother towing and easier loading. The robot-welded spindles ensure perfect welds and precise axle alignment. This handy step pad adds cushion to the frame where it is most vulnerable during loading. The key to Equiload is in the mounting of the bunks. The rear section of the bunks are mounted on a teeter-totter style bracket which pivots on the rear cross-member. When loaded, this fulcrum/lever action assures that the center section of bunk will maintain contact with the hull, giving more overall, equal support. For optimum handling and increased tread life. For added protection when loading and helps center bow eye while securing for travel. Many of our larger trailers with brakes feature axles filled with blown foam. This holds the brake lines in place and protects them from the elements. ShoreLand’r trailers have tube steel frames which allow the wiring and brake lines to run internally, protected from the elements. Tubular components are welded for a uni-frame construction increasing the overall length strength of the frame. The wrap-around frame design gives a sleek, aerodynamic profile that follows the lines of your boat. To protect wiring and keep from making contact with frame. Easily moved to fine-tune tongue weight for proper towing characteristics. Featuring a concave polyurethane center for easy centering and a low compression ratio to reduce flattening and resist cuts. The inner steel tube provides maximum strength and locks together to hold all the parts in place. Quick connect plug allows for easy hookup to tow vehicle and plug-in frame sections make maintenance a snap. The sleek, aqua-dynamic design partially encloses all moving parts, houses an extra wide bow stop and secures a bow eye safety chain. The advanced design of the winch post allows full adjustability to the unit and is pre-stamped to accept the optional tongue jack, making it a totally integrated system. On all cross-members and axles to protect the keel if contact is made during loading. Larger roller trailers also feature heavy-duty rollers with load-softening ventilator holes. Conveniently located for securing your transom tie-down straps. Not featuring Goodyear radials on most models. Equipped with a separate ground wire to guard against failure. Hardware items and many manufactured parts are plated then Ultra Sealed, providing extra resistance to corrosion. Minimum Hull Length: 216 in. Maximum Hull Length: 240 in. Maximum Transom to Bow Eye: 220 in. Frame Size: 2 in. x 4 in. x 11 ga.
Rear Cross Member Adjustment: 12 in. Tongue Tube Size: 3 in. x 5 in. x 11 ga.
Hub Size: 1-3/8 in. x 1-1/16 in. Bolt Pattern: 5 bolts on 4.5 in. Bunk Dimensions: 2 in. x 6 in. Keel Protective Pads (# - size): 2 – 15 in. We don’t want the trailer to overwhelm the boat so we’ve selected just the right amount of color in our stylish wave design. Standard on 2,800 lbs. and larger models. Machine-formed brake lines enclosed in a foam-filled and sealed axle to prevent damage and corrosion.